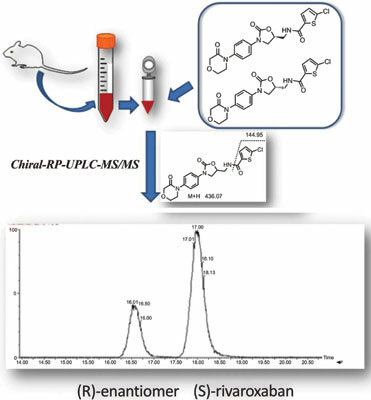 Keywords: UPLC-MS/MS, enantiomers, rivaroxaban, chiral separation, in vitro, chiral inversion. Keywords:UPLC-MS/MS, enantiomers, rivaroxaban, chiral separation, in vitro, chiral inversion. Abstract:Background: Rivaroxaban is the first oral, selective direct FXa inhibitor with rapid onset of action and its biological toxicity may be related to the enantiomer.